Thanks for the mention Headlines & Heroes! They are the ultimate destination to find great gifts for men and the curators of cool for culture, gadgets, living, style, rides, body and entertainment. 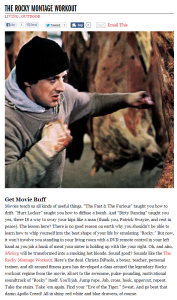 Check out their site and of course the “Rocky Montage Workout” article. Cheers.